Billy the gamekeeper shot his first gun in 1947. He turned 80 three weeks ago and looked as comfortable with a cocked gun under his right arm as Linus did with his security blanket in the Peanuts cartoons. Last night saw the fourth in a series of Farm Focus Days held at Christmas Farm in the hills of Northumberland by G and S Organics . The Focus Days aim to give the farm’s box scheme customers a real insight into life in the countryside and into where the food on their plates comes from. There was a demonstration of the skills of hunting dogs with a beautiful cocker spaniel zig zagging across the fields in the low afternoon sunshine, carefully retrieving birds and returning them to its handler. Previous Farm Focus Days have included farm tours, butchery demonstrations and cookery demonstrations held in the packing shed where wooden boxes are filled each week with organic fruit, vegetables, herbs, eggs and bread. Meat from the farm is packed into cool boxes and the weekly offering changes with the seasons before being delivered to customer’s doorsteps. “I love it when it’s meatballs!” said Rose, 9, from Whitley Bay. “They’re so delicious.” Lee Gray, the farmer, smiled and said “It’s the lamb season now – although we’re eating a leg of pork tonight”. Behind him a trestle tabled groaned under the weight of a venison terrine, loaves of bread from The Great Northumberland Bread Company, a red cabbage and elderflower salad and a terracotta pot filled to the brim with chicken liver pâté. The pork joint sparkled beneath it’s salted crush which gave way to succulent roasted meat. After half an hour another baking tray arrived which carried two trout which one of the event’s guests had brought along to contribute to the feast. At the bottom of the field the sound of gunfire ricocheted off the surrounding valley as guests from all over the country tried their hand at clay pigeon shooting. Cheers went up as the first of the clays was hit with some guests managing an incredible six out of six shots. The day was a huge success for both Lee and Beth Simpson who run the farm. Friends Michelle and Gary Nicholl had erected an enormous marquee which sheltered the many children from the blazing sun until the lure of quacking ducks, a ditch and a large amount of mud behind the marquee drew them to play. It was a far cry from an evening spent glued to the television as Jake, 2, pointed to the ditch and said “More! More stream!” and watched as Anna, Ingrid, Billy, George and Oliver got muddier and muddier. 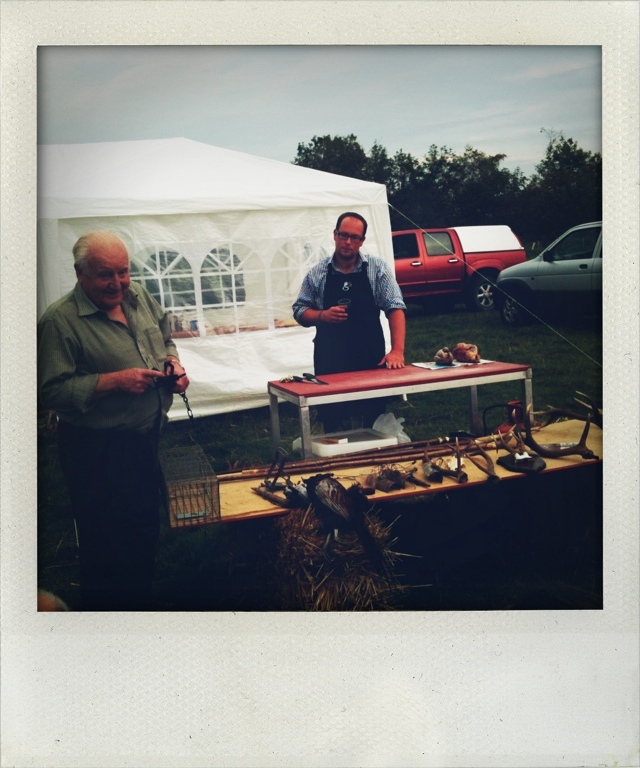 The evening finished with Billy the gamekeeper giving a demonstration of his skills, a guide to the various types of deer found in this country and a how to demonstration on plucking a pheasant which Lee then butchered to show the different cuts of meat. The next planned Farm Focus Day is on the first Saturday in November and will require wellies, coats and stamina and guests help to plant trees around the farm. It’s great to see that “buying local” is the catchphrase for saving the world from genetically modified foods, not just in our own little corner of Vermont, USA but in your little corner across the great water. We like knowing from where our dinner came; we like being able to pass the field where it all began, or just hit the kitchen garden up for a root or two. I’d much prefer having my broccoli grown in organic poop if I can pet the animal that dropped it too. Wish I could come help in November, but alas I’m a poor swimmer. Have fun! Hi Kenric – thanks so much for your comment. Local food just tastes so much better doesn’t it? Scraping mud off carrots is a soothing way to start a meal!